Carrying a lot of financial baggage as she starts her adult financial life, Ashley Cheeks needs some help with the heavy lifting. The 23-year-old is within months of earning her bachelor’s degree and is interviewing for full-time positions as a community service officer for local governments. Once she graduates, though, she’ll owe a whopping $71,677 in student loans on top of nearly $30,000 in car and other loans. All this on a part-time salary that equates to a gross $20,288 a year. Like a lot of young people with hopes and dreams for the future, Cheeks believed she would need a college education to secure her financial footing as an adult, and she was on her own to pay for it. She chose a private university in suburban Chicago, and during her first year she qualified for several grants that kept costs down. But while working full time during her sophomore year, her grades slipped, she lost the grants and she has been taking out education loans to cover tuition since. All the while she has worked full time or part time in municipal jobs. Cheeks has made some rookie mistakes early on in her adult life, said Mari Adam, president of Adam Financial Associates Inc. in Boca Raton, Fla., but her situation is not hopeless. Thinking about the pile of debt, and knowing she has just $120 cash in the bank, has been a stressful situation for Cheeks, prompting her to write to Money Makeover for help. “I’ll be honest. It really hurts,” Cheeks said when asked how the debt load makes her feel about where she is in life. “There’s so much I want to do in life, and this debt hurts.” Adding a $23,000 car loan several months ago to purchase a slightly used 2007 Chevy Malibu hasn’t helped much. The car replaced a 17-year-old Chevy that was costing more than its worth in repairs, but it has still been a burden to make the payments. Since she made that purchase, her full-time hours were cut back to part-time in a cost-saving move by her employer. Working 31 hours now, her car expenses eat up almost 60 percent of net pay, Adam pointed out. Making matters worse: She has two unpaid medical bills totaling $5,200 that are now in collection, which made her credit score plummet. That resulted in an interest rate for the car loan of a stunning 18.7 percent. Her education loans carry rates of 10.25 percent and 7.22 percent. She’s also carrying $1,416 in credit card debt. “You’ve got to repair your credit because everything you do is being impacted by this, including your car and renter’s insurance rates and your chances for homeownership,” Adam said. Fortunately, Cheeks has been sharing a lot of living expenses with a roommate, which is the only reason she has squeaked by the past few months without boosting her credit card debt, the planner said. Some other things are looking up, too. Since beginning the Money Makeover process, Cheeks accelerated her interviews for full-time work and is close to accepting a position as a community service officer that would pay about $37,000 a year and offer full health and retirement benefits. Although she believes she’ll advance more quickly as a college graduate, the degree is not required for the entry-level position. So Adam suggested that she stretch out those last few classes as long as possible to put off the date when she must start to repay the college loans. “This is really sizable student debt,” Adam said. “Even when you’re making more money, a lot of it is going to be absorbed in paying this off, and it’s going to delay your savings plan. Normally after graduation, you’d start saving in a retirement plan and for a home, but I’m not sure you’re going to be able to do much of either of those for quite a while.” Instead, she needs to immediately attack the medical and credit card bills, then select a payback plan for when the education loan payback kicks in, Adam said. Most likely, she should shoot for graduated payments of between $200 and $400 a month, Adam said, depending on her actual income when she starts work. The lion’s share of the medical bills stems from a car accident Cheeks had a couple of years ago. She did not file an insurance claim with her university because she says she was told it wasn’t covered under her school policy. Adam urged her to file a claim and do some more investigation to determine whether her school insurance should have covered the accident. Failing that, Adam said, Cheeks should approach the company handling the medical claims and ask to work out a payment plan based on her income. Meanwhile, she should take her $600 income tax rebate this year and use it to pay off one of her credit card bills of $416. The remainder should be used to start an emergency savings fund, Adam said, because she will need to pay living expenses entirely on a cash basis while she repairs her credit. To avoid another unpleasant dip into credit, Adam suggested setting up a cash flow budget so she can begin to track expenses. Although her finances are fairly simple now, they will get much more complex as she tackles the debt, and it’s vital that she stays on top of her expenses. Retirement savings? Still a pipe dream, Adam said. Cheeks believes she has been paying into a retirement plan at her current part-time job, but she said she is having difficultly getting statements and that employees have filed inquiries about the plan. At a minimum, Adam said, she should request in writing to the plan that no more funds be withdrawn from her paycheck for retirement. 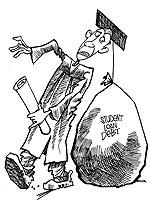 Student Loans - A Raw Deal? I'm three apples high and nearsighted. I like yellow-haired smurfs, robot invasions, sarcasm, and anything where the secret ingredient is love. Student Loans – A Raw Deal?